Nobody messes with Frank Castle... except Entertainment Earth. The Punisher is now a retro-styled, 2-inch scale wooden collectible! Number S05 in the Pin Mates™ Silver Series. Vigilante Frank Castle is a fearsome sight to criminals, but this retro-styled, 2-inch scale wooden collectible will be eagerly welcomed by his many fans! 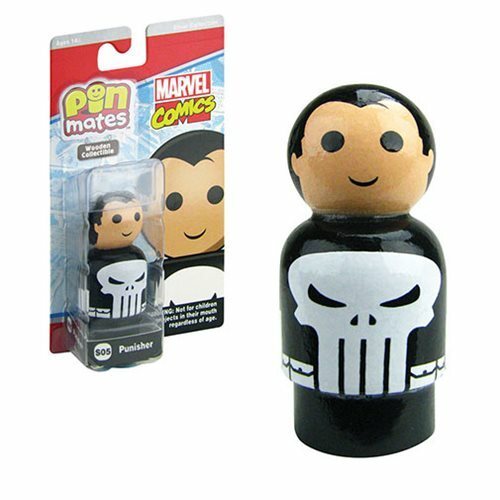 From Entertainment Earth, the adorable, individually numbered The Punisher Pin Mates™ Wooden Collectible is number S05 in the Pin Mates™ Silver Series. He features 360-degree artwork that includes his trademark skull logo. Add The Punisher to your desk or toy box today! Ages 14 and up.